The Queen Mary University of London and Hellenic Management Centre open its door to potential students of the LLM in International Shipping Law Programme on Wednesday, 8th of May 2019 from 11:00 to 19:00. - Non-Law Graduates / working professionals with relevant professional experience that directly relates to the specialist LLM taught courses. Members of the Institute of Chartered Shipbrokers along with professional experience will also be considered. In order to meet Ms Angeliki Polatou, Postgraduate Programme Administrator (Piraeus/Global), CCLS, QMUL, book your time slot at the following link: www.helmc.com/llmopenday. Hellenic Management Centre and ICS Greek Branch had the pleasure to organize a visit on- board SS Liberty Museum for the high school students of HAEF, on Thursday 7 March 2019. A welcome address was given by Mrs Natalia Margioli, Managing Director of HMC / ICS Greek Branch and then Cpt Evangelos Kouzilos, the museum’s manager, made a presentation on the history of Hellas Liberty ships, explaining how Liberty Ships were donated by America to Greece as a sign of recognition for their contribution during World War II. Also, the students had the opportunity to attend a 1-hour session within the museum on the topic “Why Shipping Matters?” delivered by Mr Simon Ward, Managing Director of Ursa Shipbrokers and a Fellow Member and lecturer of the Institute of Chartered Shipbrokers. It was a good first insight into shipping’s contribution in world trade, commodities, shipping management structure and other basic factors of commercial shipping. Last but not least, all students were given a guided tour through the vessel starting from the permanent photo exhibition that is hosted on board and ending with bridge and engine room, while Cpr Kouzilos willingly answered to all of their questions. The Centre for Commercial Law Studies (CCLS), Queen Mary University of London, and Hill Dickinson LLP International organized on Thursday, 28th February 2019 a roundtable discussion on Bills of Lading. Welcome remarks were made by Mr Andrew Dyer, Partner at Hill Dickinson. Professor Yvonne Baatz from CCLS, Mr Ieronymos Bikakis and Mr Andrew Dyer from Hill Dickinson discussed the common issues of Bills of Lading arising when carrying bulk cargoes. Dr Miriam Goldby, Reader in Law at CCLS, chaired the discussion. The seminar was well attended by shipping professionals of all spectrums of the industry. Queen Mary University of London offers in Piraeus, Greece its innovative LLM in International Shipping Law in partnership with Hellenic Management Centre. It is a programme of excellent academic standards, in the heart of a major international shipping centre. Within this context, QMUL enhances its presence in Greece by collaborating with Hill Dickinson, an international commercial law firm with long lasting presence in the Greek Shipping Market and organizing educational and training events for the legal and commercial shipping professionals. The Queen Mary University of London and Hellenic Management Centre open its door to potential students of the LLM in International Shipping Law Programme on Wednesday, 20th of March 2019 from 11:00 to 19:00. In order to meet Ms Angeliki Polatou, Postgraduate Programme Administrator (Piraeus/Global), CCLS, QMUL, book your time slot at the following link: www.helmc.com/llmopenday . On Wednesday 30 January 2019, ICS Students Visit on board”TAMPA TRIUMPH” Containership at Piraeus Container Terminal. Students were grateful to be given the opportunity to visit a vessel, the integral part of commercial shipping they have been long studying in theory, while preparing for the ICS Professional Qualifying Examinations, leading to ICS Membership, the only professional qualification that is internationally recognized as a mark of competence for shipping professionals. Special thanks to Mr Nikos D. Marmatsouris, FICS, Senior Marketing Manager of GAC Shipping S.A. for arranging the visit onboard, the captain and the crew of the vessel for taking on tour the ICS students and they were more than helpful and willing to answer in all of their questions. The Institute of Chartered Shipbrokers Greek Branch and the Baltic Exchange held for their Members their 3rd Masterclass Seminar (Series2) and the cutting of the traditional Vasilopita cake on Wednesday, 30th of January 2019 onboard ‘’SS Hellas Liberty’’. 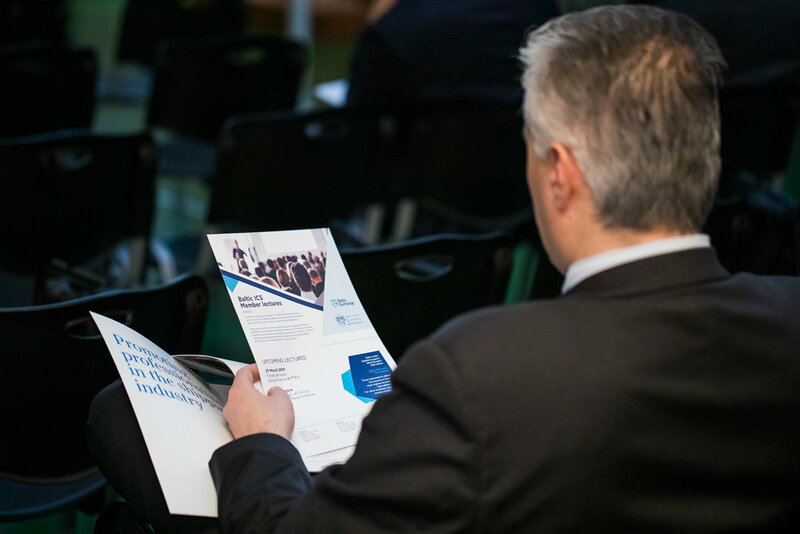 The 3rd Masterclass Seminar, part of the joint lectures organized by ICS and Baltic Exchange for the second year and in 4 locations worldwide, was on “Economic Cycles & Shipping”. The guest speaker, Mr Simon Ward, FICS, Director, Ursa Shipbrokers, shared his ideas with the audience regarding freight market cycles and how have trends in cargo flows changed, what has the impact been from the vessel supply side, as a result of the evolution of the shipowner and the ever-changing ROI horizons for their investors. Following the Seminar, both organizations cut the Vasilopita in a traditional Greek ceremony to welcome the New Year and held a cocktail reception for the ICS and Baltic Members. The winner of the lucky coin of the Vasilopita won a plane ticket to Rome, a kind sponsorship of Anyland Travel Agency. Members, shipping practitioners, friends and colleagues had the opportunity to network and exchange their views on several shipping matters. The Baltic Exchange is the world's only independent source of maritime market information for the trading and settlement of physical and derivative contracts. Its international community of over 600 members encompasses the majority of world shipping interests and commits to a code of business conduct overseen by the Baltic. The Institute of Chartered Shipbrokers, founded in 1911 within the Baltic Exchange historical building, is the professional body which represents all aspects of the shipping business and includes in its membership not only shipbrokers but shipowners, charterers, agents, forwarders and other shipping professionals. Through its Professional Maritime Courses and ICS Membership Qualification, ICS is dedicated to the setting and maintenance of the highest standards in commercial shipping industry worldwide. Baltic Exchange and ICS are sister organisations and work under the common motto “Our Word, our Bond’’; a business ethic motto imparts confidence into the industry worldwide. Joint lectures and events prove their long-standing and traditional relation dated back in the middle ages of Maritime Profession at the City of London. We are looking forward to seeing everyone again to the upcoming Masterclass Seminar on 19th of March 2019 with the topic ‘‘Financial Tools (Ship Finance &FFAs)”. The HMC / ICS Greek Branch is opening its doors to potential students on Wednesday, 16 January 2019 from 11:00 to 19:00. Find out more about the ICS Annual Professional Maritime Programme & ICS Examinations, what it offers & its entry requirements. Learn about the ICS Membership, the unique hallmark of professionalism in the international shipping industry. The ICS Professional Maritime Programme opens the doors to unrivalled network of like-minded professionals, and conveys the highest standards of expertise and integrity to employers, clients and to all those working in the sector. - Officers of the Merchant Marine – willing to enhance their sea-going experience and practice with the commercial knowledge. Registration: In order to register at the Open Day, please click here. Christmas is not as much about opening our presents as for opening our hearts! On this note, HMC & ICS Greek Branch, organized once again their Christmas Party, on a mission to spread the Christmas Spirit ! The event took place on Tuesday 18th of December at “Polychoros Simeion”, in Piraeus and was very well attended by students, ICS Members and Tutors who danced the night away. It was an important networking opportunity for students while Members had a chance to catch up, bring on the festive spirit and celebrate. It was a perfect way to start off the festive season cheer! We wish you all a Merry Christmas, all your wishes to come true and feel this happiness all year around! 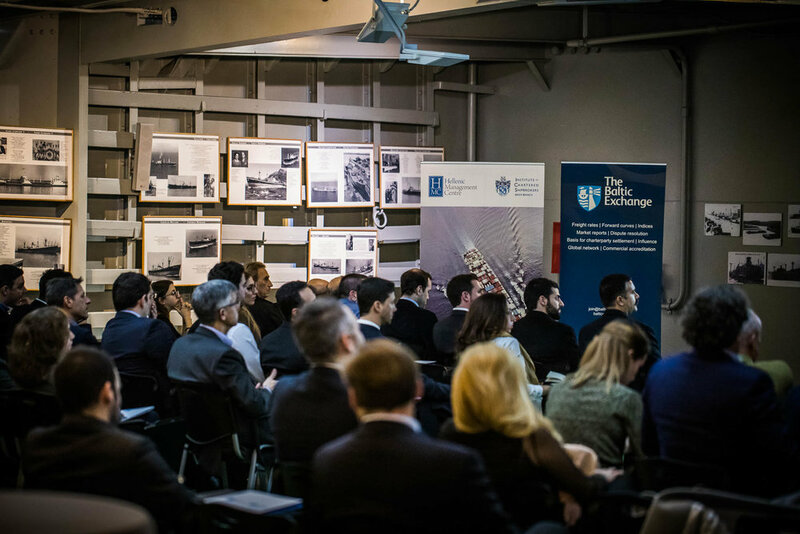 The 2nd Masterclass Lecture organized by the Institute of Chartered Shipbrokers and the Baltic Exchange, took place in Greece, on Wednesday, 28th of November 2018 at the premises of the ICS Greek Branch in Piraeus. Mr George Lambrou, FCIarb, MICS, Maritime Arbitrator and Consultant Solicitor Advocate (England & Wales) at Keystone Law, London, covered the basic pitfalls arisen from Charterparties, used recent example cases, highlighting the negotiation pitfalls and examining the point at which arbitration could have been avoided. The event was well attended by Members of the Baltic Exchange and the Institute of Chartered Shipbrokers. They had the chance to network and exchange views and ideas on this crucial topic. The lecture was free for the Baltic Exchange, ICS Members & ICS Students and it was a great opportunity to enhance their professional development. The third Masterclass lecture will take place on 30 January 2019 and the topic to be covered is Economic Cycles & Shipping. More information will follow shortly. The event was held on the occasion of the graduation of last year’s student cohort of the LLM in International Shipping Law (Piraeus, Greece), an innovative programme offered in Piraeus by Queen Mary University of London. Students and attendees were welcomed by Professor Ian Walden, Director of the Centre of Commercial Law Studies, Queen Mary, Dr Alexandros Ntovas, Director of the programme, as well Ms Natalia Margioli, HMC Managing Director. Both QMUL and HMC representatives congratulated students on their achievements so far but also reviewed the importance of the programme and what it has offered them in order to succeed in their endeavors. The programme is taught by the Centre for Commercial Law Studies (CCLS), who have a world-wide acclaimed reputation as a provider of high-quality education in commercial law, which can be placed at the service of governments, public bodies, overseas institutions, the legal profession, industry and commerce. To this end, the LLM in International Shipping Law in Piraeus honours the long-established Greek tradition in shipping by bringing a programme of excellent academic standards in the heart of a major international shipping centre. It is delivered by the CCLS academic staff at the prestigious facilities of the HMC in Piraeus, and it is designed to equip maritime professionals and graduates alike with an in depth understanding of legal theory while gaining new perspectives on shipping issues. The programme is taught in six intensive blocks throughout two academic semesters, so that it can be fitted in with their other professional commitments. It was a successful and well attended event which proved once again that Piraeus is truly part of an international shipping network and a maritime educational hub. An onboard visit was arranged for the ICS students on 30th October 2018 in a Feeder Container vessel at Piraeus Container Terminal. The students were taken on a tour onboard vessel while members of the crew explained her main parts and equipment and their relevant functions. Everyone went through accommodation, bridge and engine room. The Captain led our students to the bridge, explaining the main advanced systems of the vessel such as ECDIS and the loading plan of the cargo. Then, the Chief Engineer guided them at the engine room with the main engine and the electric generating station. Students had the opportunity to watch live the loading of containers with cranes as well as a ship-to-ship bunkering procedure. It was a good insight into the reality of merchant ships in action. Special thanks to the Master and the Crew for taking on tour of the vessel the ICS Students and for their willingness to answer in all of their questions. They were more than helpful and comprehensible. Last but not least, we would like to thank Mr. Nikos Marmatsouris, Fellow Member of the Institute and Senior Marketing Manager of GAC Shipping S.A. for arranging this special experience, of an onboard visit. Students were grateful for having the opportunity to visit a vessel, the integral part of commercial shipping they have been long studying in theory, while preparing for the ICS Professional Qualifying Examinations, leading to ICS Membership. Greek Prize Winners at the Institute’s Prize Giving Ceremony 2018 in London. This year the Institute’s Prize Giving Ceremony took place on 18th of October 2018 at the prestigious Trinity House in London. The event was well organized and as always to celebrate student’s successes at the ICS Professional Qualifying Examinations in November 2017 and May 2018. Opening remarks were given by the UK Under-Secretary of State at the Department for Transport, Nusrat Munir Ul-Ghani MP, who welcomed the guests and congratulated all distinction students. Among the prize winners winning multiple prizes, five students from Greece were awarded for their excellent performance at the ICS Examinations worldwide. Dionysios Diamantopoulos, received an award for gaining the highest mark worldwide at Shipping Business Examination. Thomais Dova, MICS, received an award for gaining the highest mark worldwide at Dry Cargo Chartering Examination. Sara Jones, received an award for gaining the highest mark worldwide at Port Agency Examination. Foteini Konstantinou, received an award for gaining the highest mark worldwide at Shipping Law Examination. Paraskevas Kousounadis, FICS, received an award for gaining the highest mark worldwide at Ship Sale & Purchase Examination. Lord Mountevans, the International President of the Institute of Chartered Shipbrokers, congratulated all Prize Winners by saying the below inspiring words: “We are here to celebrate the achievements of our students, together with friends and colleagues from all over our maritime world. We are truly grateful for your efforts in your studies. You are not only the future for our Institute, and for our industry, and we are all very proud of you and your achievements”. After the awards ceremony, attendees had the chance to meet and network with fellow students, Institute’s officers and prominent industry figures at a dinner reception. On Wednesday 18th of October the Institute of Chartered Shipbrokers welcomed over 100 guests to their Annual Prize Giving Ceremony at Trinity House in London, where distinction students were awarded for their performance at the ICS Examinations. Among the eminent guests attending the event were: the UK Under-Secretary of State at the Department for Transport, Nusrat Munir Ul-Ghani MP, the Lord Mountevans, the new International President of ICS and other senior officers and fellow members of the Institute of Chartered Shipbrokers worldwide. A special moment of the evening was when Lord Mountevans gave an inspirational speech and awarded three extraordinary people for their contribution to the Institute of Chartered Shipbrokers and to the maritime profession globally. Upon this, the Sworn Shipbroker Medal was given to Mrs Natalia Margioli, Fellow Member of the Institute of Chartered Shipbrokers and the Managing Director of Hellenic Management Centre/ ICS Greek Branch for her contribution to the Institute and the development of the Greek Branch as a top educational and membership centre. Lord Mountevans specifically mentioned that ICS Greek Branch, after hard work, persistence, tenacity and charm, has become in just 12 years the largest ICS centre in the world and that each year prize winners from Greece scooping up awards. Most importantly, he pointed out that Natalia Margioli has inspired and opened a pathway for thousands of young people in Greece to make their careers in shipping industry. Natalia Margioli, Dennis Ray and John Grange receiving their Sworn Shipbroker Medal by Lord Mountevans. The other two personalities awarded for their contribution were Mr John Grange, Fellow Member and Vice Chairman of ICS Federation Council, Mr Dennis Ray important member in London’s ICS Branch and a trustee of the Educational Trust Fund, each in their unique way reflect the remarkable history of the Institute and the foundation we build on in our branches across the world. At the end of the evening formalities and photographs had taken place and afterwards all guests were invited at a dinner reception. Queen Mary University of London and the Hellenic Management Centre announce that applications for the 2019 intake for the LLM in International Shipping Law (Piraeus, Greece) are now open. The programme is taught by experts of the Centre for Commercial Law Studies of the Queen Mary University of London, one of UK's leading research-focused higher education institutions with its Law Department currently being ranked 3rd in the UK and 1st in London. The programme is taught in co-operation with the Hellenic Management Centre (HMC), a leading maritime training centre committed to professional education and development within the shipping industry since 1999. HMC is, also, the Official Educational Provider of the Institute of Chartered Shipbrokers in Greece. “Wet” Shipping Law: Collisions and other Incidents at Sea. The programme is addressed to Lawyers, Law graduates, and Shipping Professionals with relevant work experience and an academic background. The entry requirements for Law graduates are a degree in law, or a degree with substantial law content, normally of at least upper second class honours (or equivalent 7/10), whereas non-law graduates will be considered on the basis of professional experience that directly relates to the specialist LLM taught courses. Membership of the Institute of Chartered Shipbrokers along with professional experience will also be considered. The QMUL LLM in International Shipping Law Course is a great opportunity for shipping professionals, who wish to attend a flexible, top-ranked postgraduate LLM programme in Greece offering them the opportunity to develop academic and professional expertise in specialized areas of global maritime law. Admissions for the next intake September 2019 are now open. Steaming towards 2020. Are we ready? The 2nd Annual Lecture Series organized by the Institute of Chartered Shipbrokers and the Baltic Exchange was launched with the first Masterclass Lecture on 26th of September 2018, at the premises of the ICS Greek Branch in Piraeus. Dr John Kokarakis, Vice President, Technology & Business Development Hellenic-BS-ME Zone at Bureau Veritas, discussed about the challenges of the new regulation of 2020 Sulphur Cap and shared his thoughts and experience on the various issues around the 2020 Regulations. The event was well attended by Members of the Baltic Exchange and the Institute of Chartered Shipbrokers. They had the chance to network and exchange views and ideas on the new regulation which will change the shipping business in the future. The second Masterclass lecture will take place on 28 November 2018 and the topic to be covered is Legal eagles. More information will follow shortly. Queen Mary University of London organised its induction weekend for the LLM in International Shipping Law (Piraeus, Greece), from 7th to 9th of September at the Hellenic Management Centre premises in Piraeus. Once again, this prestigious and successful event initiated the new academic year of the programme, which runs for the fourth year in Greece and is based on the successful London-based LLM in International Shipping Law. The programme is taught by experts of the Centre for Commercial Law Studies of the Queen Mary University of London, one of UK's leading research-focused higher education institutions, with its Law Department constantly ranked in the top 5 of the UK. This innovative postgraduate programme offers students the opportunity to develop academic and professional expertise in specialized areas of global maritime law, including International Regulation of Shipping, Maritime Arbitration, Charterparties: Law and Practice, Marine Insurance Law (including a Protection and Indemnity (P&I) Clubs workshop), Carriage of Goods by Sea, “Wet” Shipping Law: Collisions and other Incidents at Sea. It is taught in intensive afternoon and weekend blocks throughout two academic semesters, so that it can be fitted in with any other professional commitments. It is considered by the shipping industry as a unique opportunity for students and maritime professionals living in Greece, to attend it without having to relocate. The Induction weekend gave the students the opportunity to get acquainted with all the information and details regarding the programme. Students were excited about the academic introduction to the programme, as well as the introduction to the learning experience that they will go through. By attending this programme, they will get the support they need to excel in their field and have a great impact in the shipping industry using their acquired knowledge and expertise. Wishing a great academic year to our QMUL Students!